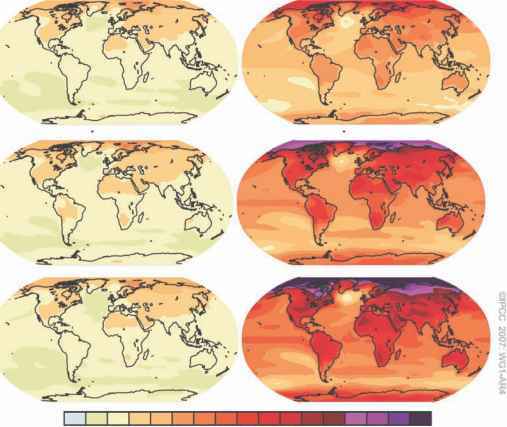 The Intergovernmental Panel on Climate Change (IPCC) predicts that by 2050, mean temperatures around the planet may rise by between 2 and 5°C or more and atmospheric CO2 concentration are likely to be > 550 ppm (cf. 380 ppm at present). Tropical and semi-tropical climates in particular are expected to experience dramatic increases in temperatures, as well as more variable rainfall (Jarvis et al., Chapter 2, this volume). Of serious concern is the fact that most of the world's low-income families dependent on agriculture live in vulnerable areas, namely in Africa and Asia. Not surprisingly, climate change has been acknowledged as a major challenge to future food security (Lobell and Burke, Chapter 3, this volume). productivity. Temperate cereals such as wheat and barley, on the other hand, are relatively well adapted to drier environments, being grown widely throughout the world in semi-arid regions such as North Africa, Central Asia and Australia. Ongoing breeding work has made steady progress in improving performance (e.g. Trethowan et al., 2002; Ammar et al., 2008). However, performance of cereals shows substantial loss at high temperature (Wardlaw et al., 1989; Reynolds et al., 1994) and significant breeding effort will be required to maintain their productivity under warmer conditions. For C3 cereals (wheat, barley, rice), there is some evidence that increased CO2 will partially offset the effects of higher temperature and drought through improvements in the water-use efficiency, however, the extent of its impact on productivity is still in doubt (Leakey et al., 2006). Already, a large portion of global variation in crop yield is explained by rainfall and temperature fluctuation and this will increase as climate changes (Jarvis et al., Chapter 2, this volume). Specific scenarios in which their detrimental effects are likely to be most devastating include situations where irrigation water is not available to compensate for decreased rainfall or to mitigate the effects of higher temperature via evaporative cooling of leaves, and in agro-ecosystems where soils have been degraded to a point where they no longer provide sufficient buffer (e.g. adequate water-holding capacity) against drought and heat stress. These problems cannot be addressed by improving genetic adaptation to heat or drought stress alone and readers are referred to the chapter on conservation agriculture (Hobbs and Govaerts, Chapter 10, this volume); investment in genetic improvement will be best realized if crops are grown in well-managed soils that maximize expression of genetic potential, buffer the crop against weather fluctuations, and guarantee long-term returns by stabilizing the natural resource base. The remainder of this chapter will outline the challenges of genetically improving major food crops to adaptation to warmer and drier conditions. We first consider that research focused on genetic improvement should be conducted with adequate knowledge of the environmental factors that interact with trait expression to ensure that genetic gains achieved in breeding environments are realized at target locations and across years (Salekdeh et al., 2009). This section is followed by an overview of the genetic and physiological basis of adaptation to drought and heat stress in the context of traits having known or probable economic significance. Several case studies of successful genetic improvement strategies are presented in a range of cereal crops. Lastly there is a discussion on promising future approaches to raise the genetic yield threshold of crops under heat and drought stress, and on strategies to accelerate genetic gain.